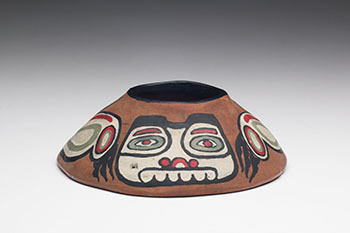 In 1924, Emily Carr, to supplement her income, produced crafts such as hooked rugs and pottery. For the pottery, she used clay that she dug herself from locations such as Dallas Road in Victoria, and used a home-made kiln in her back yard to fire her hand-built clay objects, which included candlesticks, totems, bowls, pots and lamps. These single-fired objects were then painted with a variety of native motifs, such as the bear motif that dominates this bowl. She signed her clay objects Klee Wyck, a name given to her by the West Coast First Nations peoples, which meant “Laughing One”. Charles S. Band corresponded with Carr between 1936 to 1945 and supported her by acquiring several of her most important paintings. Maria Tippet writes, “In March - April 1937 the Art Gallery of Toronto, motivated by the enthusiasm of Charles Band, gave Emily a solo exhibition of some twenty paintings.” As with all Band works, whereby each is the best example within the context of the artist's work, this is a superb larger scale ceramic by Carr.